Canadian native and Internet phenom Chantal Sutherland will leave Santa Anita to begin riding at Woodbine in Toronto when it opens April 4. After Woodbine’s opening weekend, Sutherland will come back to Santa Anita and stay until the meet ends on April 19. Afterward, she will remain at Woodbine for the racing season, Sutherland told the the Daily Racing Form’s Steve Anderson. However, Sutherland, 33, is thinking about riding full time in Southern California in the future. Sutherland is one of the riders featured in the “Jockeys” reality show on the Animal Planet network. The show has increased Sutherland’s popularity and on Maiden King she is by far the most searched name. Sutherland, who grew up in Toronto, won her first race at Woodbine on Oct. 9, 2000. 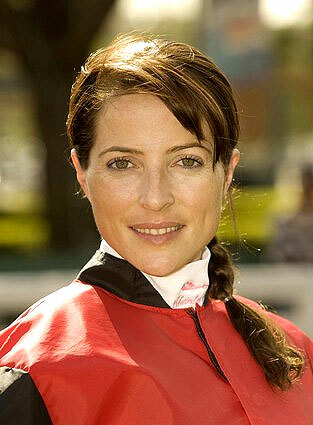 In 2001 and 2002, Sutherland was voted the Sovereign Award as Canada’s top apprentice jockey. She was eligible to win the award for two years because time did not elapse on her 12-month apprenticeship when Woodbine was closed for the winter. In 2002, Sutherland became one of Canada’s highest paid female athletes when her horses earned $5.7 million for their owners, according to Wikipedia. She rode in Canada until 2005 when she headed south to Florida and New York where Angel Cordero, Jr., Shane Sellers and Edgar Prado helped hone her skills. Last year, she was ranked third in the Woodbine jockey standings before starting to ride at Santa Anita’s Oak Tree meet in the fall. Through Thursday, Sutherland was 10th in the Santa Anita jockey standings with 15 wins on 112 mounts for a winning percentage of 13. Sutherland told the DRF the reason she’s going home is because she makes good money at Woodbine and has connections with several of leading owners and trainers. “I have an opportunity to go back to Canada and the purses are so good,” she said. I guess Mike will hook up with Kayla while you’re gone. She not hard on the eyes. Mike gotta roll with a lady while youre gone to canuck land!! Mike’s more respectable than that. Gotta roll with a lady? You sound 15 years old! Grow up!! i watched the last show (jockeys 9/11), chantal can do better than mike smith. their releationship seems to be one sided, when chantal needs his emotional support, mike emotions seem to be cold.